A few weeks ago my little nephew Mikey turned 2. I can’t begin to tell you how much I love this little nugget, and I couldn’t wait to make his birthday cake! I had a hard time coming up with the idea for this cake because he’s not interested in any characters or cartoons yet. He’s interested in his iPod which he’s had for about six months now. He knows exactly how to work it, and strolls around listening to country and Irish music! He’s also interested in the iPad and showed me how to play Angry Birds last time I was in New York. I definitely can’t leave out the accordion, the child loves the accordion. He loves listening to my dad play the accordion, and he has his own little one that he tries to play while tapping his foot the way my dad does. It’s ridiculously adorable! So I was thinking about making him an iPod cake, but really, he’s 2 and he’s still a baby. I figure in a few years he’ll be telling me exactly what kind of cake he wants, so while I still have some say I wanted to make something cute! 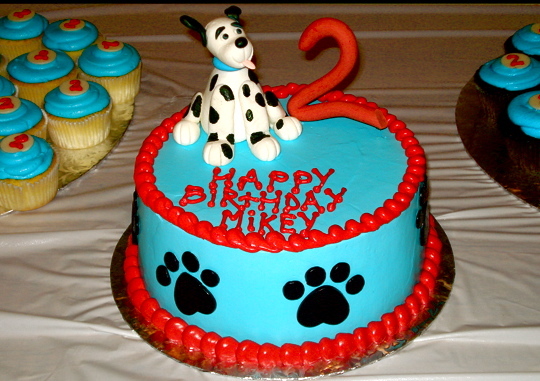 I opted to go with a dog themed cake in blue with paw prints all around the side. This then led to making a dog out of gum paste. I went with the gum paste dog because I never made one before, and I like to challenge myself. So about fifteen minutes in I was wondering what I got myself into. I’m used to making flowers and shoes, not animals! It doesn’t help that I’m severely lacking in the patience department either. Anyway after about an hour, okay maybe two, it started to look like a dog. Once I started adding the details like his ears and tail he was looking pretty cute. 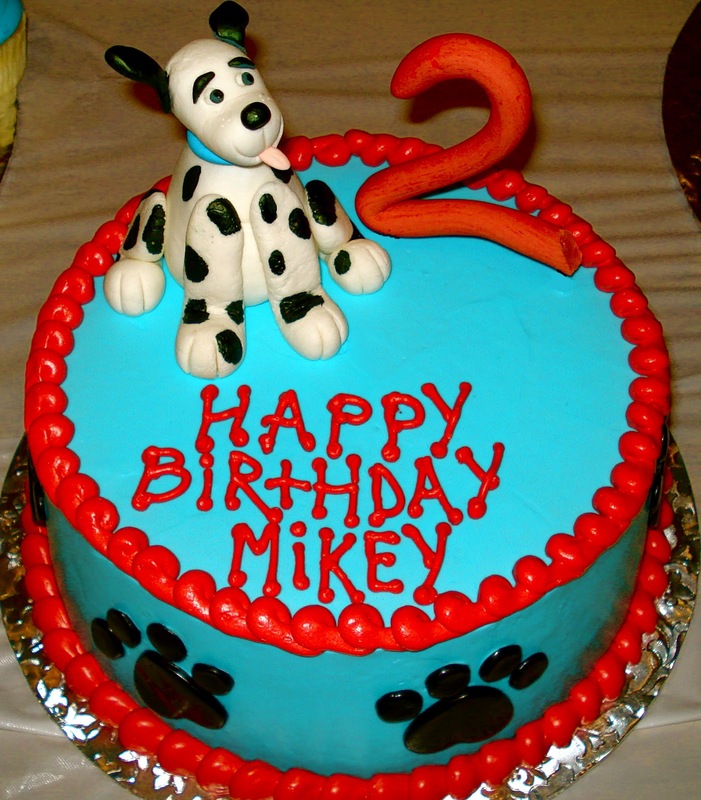 Last I painted black spots on the dog to match the paw prints I put around the cake. I then tinted some gum paste red to make a big number 2 to put on top of the cake as well. I was pretty happy with the result, and most importantly so was Mikey! The cake itself was double chocolate with a cookies and cream filling. I also made coordinating cupcakes in chocolate and vanilla which were a great idea because there were so many kids at the party. I didn’t get a picture of the birthday boy eating cake because he swiped a cupcake and had it gone in under 2 minutes! After he was done with his cupcake, we all sang Happy Birthday, and then he moved on to the accordion! And yes he plays it backwards! The following day we had cake at my parent’s house, and this time he went right for the dog! At the end of the night after all that partying when anyone would have been wiped, he was sitting in the living room still playing his accordion! I have a feeling he might grow up to be a musician! >Amazing cake! You have a way with fondant! >The cake looks awesome! The party also looks like a blast, totally up my street with the music and the accordian..
Great job you and Mikey! >That is a beautiful cake and he is such a lucky and talented little kid. I think the accordion playing "takes the cake." >Wonderful cake and happy birthday to your nephew! Those pictures are adorable-when Mikey hits it big as a musician, I can say I remember him in this post when he just started to get interested in music. >Mikey is lucky to have such a talented Auntie to make this gorgeous cake for him. And to have a Grandpa who plays the accordion. >Adorable, just adorable. I am so impressed by the doggie on top! >Wow, that fondant dog is so great, you did a fantastic job! >Fabulous cake!! And your nephew is so cuuuuute! >That is amazing! I can't believe you made that little dog! Such a cute cake, and such a cute little guy! >Oh, this cake is cute and the boy is adorable! >He is such a cutie pie and that cake is ridiculously adorable! >Oh my goodness- this cake is ah-mazing. I'm totally impressed. And that little Mikey is quite the looker- so cute! >Such a cute cake for a beautiful boy! I love it! >Mikey is such a little cutiepie! I love his little accordian – great that he is making music so young. Your cake is very cute too. I love the little dog and the pawprints. >Oh, Mikey is ADORABLE!! So cute with this accordion 🙂 And he must adore his fabulous aunt…what a work of art you made for his birthday!!! Just perfec. >what a nice auntie! the cake is fantastic, and I love the little cupcakes too! >Your nephew is absolutely adorable!!! What a great looking cake. So nice of you to make it and I'm sure it will be something he will look forward to almost every year for his birthday. >That dog is really good I seem to develop a load of thumbs when I try to make something like this. >This is too cute! I love making cupcakes but I don't have the skill (yet) for these kinds of cakes. Yours are wonderful! >Meghan! What a beautiful cake! Your nephew is just adorable! There's something to be said that he plays the accordian and uses an IPod! I think he has some gifts there! How fun that he has an equally talented aunt to make his birthday cakes! >Aw! He's so cute! What a lovely cake you made for him. >This is so adorable! I love the dalmatian and the pretty vibrant colors. I know your nephew must have loved his cake–he's such a cutie! I hope he had a wonderful birthday! >Cutest cake ever! The dog turned out beautifully. >I thought I already commented on your cake, but I don't see it. Darn internet connection! Anyway, the cake, and your nephew are too cute! I also wanted to let you know that I passed along a blog award to you! >Mikey is lucky to have a such a great and talented auntie! >Mikey is adorable and your cake is amazing! >Oh my goodness, my heart just burst a little these photos are too adorable for words to describe! I'm so glad everyone enjoyed themselves. >Wow…that's such a great looking and cute cake!!! >so cute .. belated little boy ..
>The cake is adorable! What a lucky little boy. So cute!